Here are seven fun ways to use sweet little tomatoes. Don’t just think of cherry tomatoes (and their cousins, grape tomatoes) as a consolation while you wait for the big ones to ripen. These smaller guys are often sweeter, with a great ratio of juice to flesh. They have many more uses than salad and deserve a place in other dishes. Here are seven fun ways to use these little tomatoes. 1. Tart. 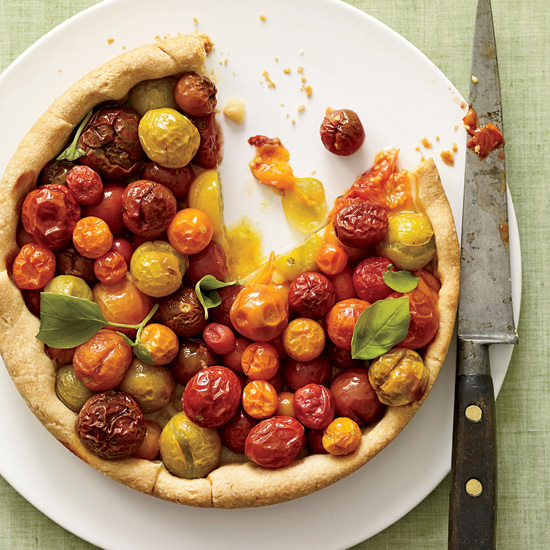 Mound cherry tomatoes in a pastry shell and bake until the crust is browned. 2. Salsa. Make a sweet-and-juicy pico de gallo or avocado salsa for flatbreads or fish tacos. 3. Burst them. Cook whole tomatoes in olive oil or butter until they pop, then use them to top crostini, as a sauce for halibut or served warm with garlic and squid. 4. Gratin. Bake tomatoes with bread cubes and herbs until the tomatoes are tender and the bread is crisp. 5. Roasted. Roast cherry tomatoes to concentrate their flavor, and serve them over crisp polenta or in pasta. For extra sweet tomatoes, toss them with some honey first. 6. Vinaigrette. Toss the tomatoes in dressing with vinegar and shallots to spoon over salmon as it cooks. 7. Granita. Remind yourself that tomatoes are a fruit and freeze them with raspberries to make an intriguing sweet-savory palate cleanser.